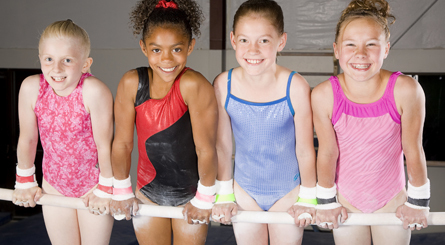 1½ hour – 1 hour of coach directed fun and play and 30 minutes for presents and cake. Parties include the entire building for you and your guest. 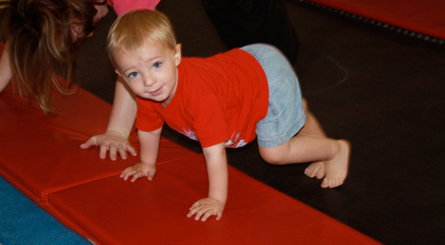 The gym will be set up with a big obstacle course ready for a Gymnastics Birthday Bash. Party activities are based on the age of the birthday child. When you arrive the tables and table cloths will be ready. We use black table cloths, you are more then welcome to bring your own if you choose not to use ours. 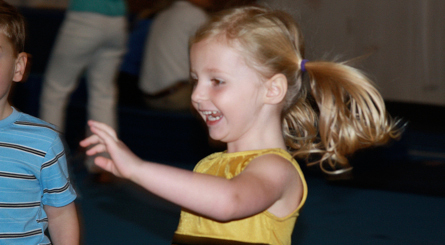 Your party also includes music, parachute games, trampoline, rope climb, foam pit and more. All mom has to bring is the food, paper products and camera. You can arrive 15 minutes prior to your party time as our staff members set up the party area for you. Call or come by the desk to schedule one. They fill up fast. Schedule early so you won’t be disappointed. A deposit of 1/2 the base price is due within one week of booking your party. If deposits are not made within one week, then your party will be canceled. The deposit holds your party time slot and is non-refundable. If you need to reschedule your party we ask that you call 2 weeks prior to your party date. Our events coordinator will contact you the week of your party to confirm the time, number of guests, and any special request your child might have. 770-422-9900 Call today to book your party, pay your half down non-refundable deposit, and be ready to have a fun filled birthday.